Add your own personal message to any of the bangles in our silver bangles that can be engraved collection, you can engrave a message on the interior or exterior of the bangle, subject to design, to create a custom gift that has meaning. All of the bangles in our personalised collection are hand made in the UK in SOLID 925 sterling silver. Quality bangles that are perfect for engraving and personalisation! Get free delivery with all of the bangles suitable for engraving here and they are packaged in a silk lined bangle box, click here for more information on our free bangle engraving service. 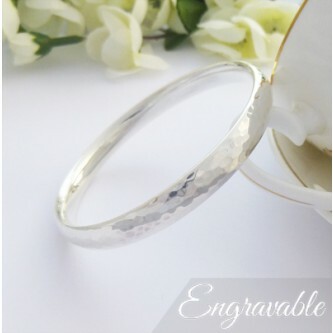 A gorgeous hammered bangle that is suitable for engraving a special message on the interior of this pretty bangle. A hammered, heavy weight, chunky solid silver bangle which can be engraved with a special message or date on the interior, beautiful! 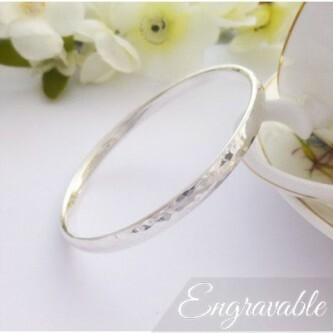 Amazing, solid hammered sterling silver bangle handmade in the UK! Large size Hammered solid silver bangle, handmade in the UK and can be engraved on the interior. Perfect for ladies with larger sized wrists. Stunning hand hammered bangle that has been made in the UK, perfect for engraving a special message on the inside. Gorgeous hand hammered solid sterling silver bangle handmade exclusively for Guilty Bangles. Guilty are pleased to announce a new collection of personalised sterling silver bangles that can be engraved and a new engraving service for our bangles in the collection. All of the bangles in the engraving category have be chosen for their suitability for engraving. These bangles are all solid and in 925 sterling silver, this means that the engraving can be deep without impacting the quality of the jewellery. As engraving is a new service, the collection within the engraveable bangles collection will be continuously growing with bangles that we feel are suitable and offer a high quality product with engraving that will last. The Guilty engraved bangles service includes a choice of fonts up to a maximum length of characters determined by the size of the individual bangle. Engraving is possible on both flat, round and oval surfaces although flat surfaces are the best and on some bangles we will only offer engraving on the flat surface. All of our bangles are hallmarked 925 sterling silver, depending on the position of the hallmark, we will endeavour to engrave around the hallmark to preserve the value of the bangle, thus there might be a small space around the hallmark. As our engraving service personalises the piece of jewellery to your wording, this would be bespoke for you and as a result, we are not able to offer a refund on our engraved bangles so please double check the wording as we will copy the wording directly from your order. Some of the benefits of the engraving service provided by Guilty Bangles is listed below. All engraving is carried out on solid silver bangles that are hallmarked in the UK.